Former Astronaut and a Magic Planet Kick-off NASA Exhibition! A Magic Planet digital video globe shared the stage with Apollo 16 Astronaut Charles Duke at the opening of the”NASA – A HUMAN ADVENTURE” traveling exhibition in Istanbul, Turkey. See the photo on Facebook! Exhibit developer, Ideum has partnered with the Miami Science Museum to create an exciting eight-screen, multi-user Magic Planet exhibit about climate change. Best of all, they’ll be sharing this exhibit with all Magic Planet customers. For more information, contact our office. 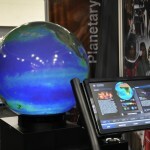 The Gippsland Water Factory in Australia has won an impressive award for it’s new facility that features a Magic Planet display. Read the press release here. The Magic Planet had a magic appearance in EdTechDigest, where it was labeled as “the evolution as one of the classroom staples”, and compared with other staples such as chalkboards and textbooks, that evolved into interactive whiteboards and tablets respectively. You can read the full article by visiting EdTechDigest.com or clicking here. The Poughkeepsie Journal highlights the benefits of using the Magic Planet as an tool to education your children about the environment, so they can be taught about global warming and other complex environmental problems when the time is right. You can read the full article here.